Soon after Dalia arrives in Palestine from Germany in 1933 at the age of 12 she is determined to acquire the skills necessary to turn wilderness into fertile ground. When she is 18, a man she idolises persuades her there are other ways to serve Eretz Israel than by taking a degree in agriculture. At his insistence she joins an organisation, Mossad Le Aliyah Bet, dedicated to bringing into Palestine Jews who have no legal permits. To achieve her aims she has to train a a secretary and infiltrate the tyoing pool at Haifa Police HQ. After four disastrous years as a spy she returns to her original ambition only to find her career disrupted yet again by the threat of German invasion and she joins a British organised resistance force. the Palmach. After Rommel's defeat, the Palmach and the British stop collaborating. Post war the Jewish struggle for Independence throws Palestine into chaos and Dalia s in the thick of it but at least she now has a dependable lover to turn to for comfort in times of sorrow and danger. But is he the right man for her? This novel, along with its predecessors, exposes often denied events of the 1930s and WW2 that were instrumental in creating the violence and chaos in the Middle East that continues to this day. 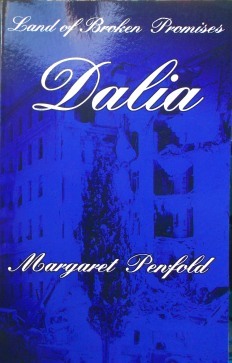 For people who have already read the first two novels of the series, this novel reveals reveals more about Dalia's life and takes the story up to 1948 with anepilogue set in the 21st century.